Won't you take me home please? Mordrude is a multimedia artist and sculptor who lives just outside Seattle, WA with her husband. She has been creating costume art to portray her inner creature since her early teens, but only since 2010 has she been crafting for others. Drawing inspiration from the old Norse mythos of Ulfsarkers and Bersarkers, she strives to create stunning realism and ferocious monstrosities. Presently her work is mostly geared towards hobbyists, but she aspires to build monsters and creatures for stage and screen. Her main goals are quality workmanship and breathtaking detail, and she spares no effort to use the best materials, techniques, and equipment to attain this. Whatever your inner monster may be, let Mordrude unleash it into the world! Q. Are your suits made with real fur? A. No, unless specifically stated and requested, I only use high quality faux fur, from a variety of sources. I use things like horse hair/other natural fibers for whiskers or accents, and occasionally real feathers as accents. Q. I paid my 30% initial payment a few months ago, but due to hardship I don't want the costume anymore. Can I get a refund? A. It seems that a lot of people commissioning costume art are unfamiliar with the way nonrefundable retainers work, so I'm going to clarify how they work with me. The non-refundable retainer is generally explained as cost of materials, but in reality it is a little more complicated than that. 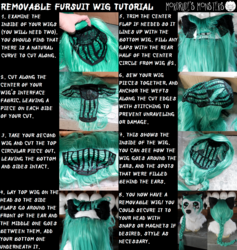 It takes time to source out materials, come up with a design (yes, even if you have detailed reference, it still takes time to translate that into a 3D design), order samples, and wait on the fur to come in, let alone shipping on the materials and supply runs locally and the like. All of this is time I cannot spend working on other projects. The retainer ensures I am compensated for my time should a cancellation occur, and for the loss of opportunity for other work should you back out once I've committed my time to your project. Therefore, in my case at least, the non-refundable retainer is exactly that - NONREFUNDABLE. That includes material refunds. Q. What are your shipping policies? A. Shipping is done through USPS. All items will be sent with tracking and insured for the full value of the contents. International customers: Your parcels will be marked as 'HS code 430400, Artificial fur and articles thereof' and the full value of the commission will be marked on the invoice and customs forms. Please anticipate your country's VAT/customs fees, these are your responsibility. Q. How do I wash my suit? A.If there is no airbrushing on your suit, washing in a machine with cold water on delicate works well. If there are airbrushed markings, it's kind of iffy. I do my best to get the most durable paints I can find, but there is always a possibility of fading. You can reduce this by turning it inside out, but with repeated washings it WILL fade eventually. I wash mine with shampoo, but a good, non-dyed gentle detergent works as well. DO NOT PUT ANY FUR IN THE DRYER UNLESS YOU HAVE TESTED YOUR NO HEAT SETTING. Fur fibers are plastic, and will melt and mat, and there is no fixing that once it happens. Heads cannot be washed, and are spot clean only. Paws are best washed in a pillowcase. Q. I want to make a suit. Tell me how you do everything! A. Help fund my Indiegogo campaign and get in on the ground level of a book designed to do just that -show you every step of the build process I use on my costumes! Also, check out my tutorials page! By making a payment toward a commission, you are acknowledging and agreeing to abide by the following terms. My artistic preference leans heavily toward realism, monsters, and natural colored animals. I will work from PG/censored reference materials, but my representation will not be a perfect copy of your reference. Markings/designs will be interpreted in my style, and may be altered slightly to best suit a 3D costume built for your shape. Any major changes will be discussed with you prior to implementation. I can only enter into a legally binding contract with customers over 18. No exceptions will be made. Projects with a hard deadline will not be accepted. I will provide an estimate for completion, but this is not to be considered a guaranteed completion date under any circumstances. I work best at my own pace, and my quality may suffer if I am put under undue pressure. Thusly, I do not accept any hard deadlines. The work I produce is consumer quality, and is not built to endure the rigors of mascot performance, athletic performance, or other professional applications. Please let me know if you require ultra durable build methods for any of these reasons, so I can quote you accordingly. As my work is a custom, handmade, wearable piece of 3D art, and not a mass-produced commodity, expect some slight variation between pieces. Some components may be fragile, and all will require proper care and maintenance to ensure the longevity of the costume. A general care overview sheet will be sent with your costume, but if you have any questions do not hesitate to ask. 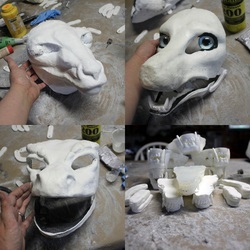 I reserve the right to reuse any molds/patterns made for your costume, not limited to horns, pawpads, jawsets, claws, tail shapes, fabric patterns, and noses, UNLESS a one-off mold surcharge is paid. I will not duplicate any design for another customer, and all characters I build are the intellectual properties of their respective owners. Quotes are only considered valid when received in response to a query submitted via my quote form, and only for the queue opening for which the quote was issued. Verbal quotes from conventions/ballpark quotes given through any means other than a response to a completed quote form are not valid. My prices fluctuate between openings to accommodate advances in skill, changes in prices of materials, and other factors, so please resubmit a quote form if you are resubmitting your character for a new round of slots. Due to the amount of quote requests I receive during queue openings, I can only respond to those who are being offered a slot. Quotes include shipping in the continental US unless otherwise noted; international customers will be asked for their mailing address so I can calculate their shipping cost and roll it into the initial quote. I reserve the right to decline a commission for any reason. I also reserve the right to cancel a commission at any point. If I am canceling due to my own reasons, such as not being satisfied you're getting my best work, or an inability to complete the commission due to personal reasons, you will receive a full refund, including your retainer fee. If I am canceling due to harassment, nitpickiness, non-responsiveness to communication, abusive language/behavior, non-payment, or breach of contract, or you are cancelling for any reason, liquidated damages shall be charged in the reasonable amount of 30% of the total cost of your commission. If you have been selected for a slot, I require a 30% retainer fee to secure your place in this round of commissions. This will be applied to your total, and is not refundable for any reason. This fee can be paid via bank transfer, Paypal, or by cashier's check, and must be received by me (or postmarked, for cashier's checks) by 72hrs from my acceptance reply to your quote form or I may move on to the next applicant. Please communicate with me if you require more time, and you would like me to consider an extension. Projects must be paid in full before construction begins. Payment past the initial retainer fee can happen one of two ways: you can pay the full total up front and be placed into the build queue at the next available slot, or you can make monthly payments of no less than $250 until your balance has been paid in full, and then be put into the build queue at the next available slot. People on payment plans are encouraged to make larger than the minimum payment! If a monthly payment plan exceeds 6 months in duration from the date of the initial quote acceptance, a requote may be required and an adjustment to the total cost may be made to accommodate changes to materials costs and advances in skill and technique. Projects on a payment plan must make their monthly payments within one week of their due date, or you will be charged a fee (10% of the remaining balance, or $100, whichever is higher) for the late payment and your project will be put on hold until you are caught up on payments. Please contact me as soon as possible if you will miss/be late on a payment. I may waive your late fee if you give me enough notice. I will consider a commission abandoned if two payments are missed in a row. Full payment is due no later than 12 months from your initial date of quote acceptance, unless otherwise agreed upon. Projects are locked once they are fully paid. No major changes (color, species, etc) may be made at this point without incurring additional fees; likewise, you will not be expected to pay more if my build time exceeds my requote period. Under no circumstances will a project be shipped/relinquished to the commissioner if there is any outstanding balance. I often work on projects in batches, but will complete costumes in the order their balance is paid in full. This may mean a customer quoted after you may be completed before your project if they pay in full before you do. Be prepared to wait 6-12 months from the time you are fully paid to receive your costume, but this is to be considered an average. Your wait may be longer or shorter, depending on the size of my queue. When I am ready to begin construction on your project, I will request a DTD (duct tape dummy) to be made (if applicable). Only DTDs made using my provided tutorial will be accepted. 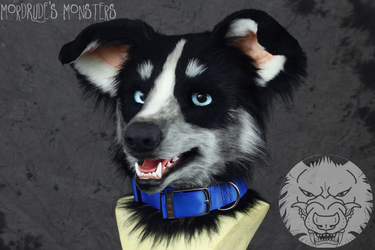 Do not use any other tutorial to build your DTD! I will ship you the materials required to make a DTD to my standards, and you will be required to pay shipping to return it (and any leftover supplies) to me. If I receive an improperly/poorly made body DTD, there will be a $75 charge to repair it myself (if possible), or I may require you to remake the DTD at my discretion. The fee for repairing incorrect foot DTDs is $25. 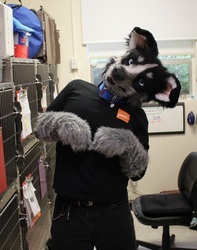 I need to receive your DTD within one month of your receipt of the materials, or I will bump you down a slot and move on to the next in line. 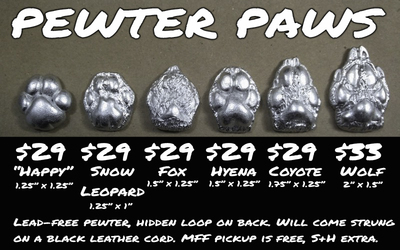 If you are local to the Puget Sound, WA region, or attend RainFurrest here in September, I may be able to help make your DTD. There is no charge for this service, but arrangements will need to be made within 30 days of requesting it as outlined above. Work in Progress (WIP) photos are posted on my Facebook/Twitter page most frequently. If you would prefer emailed WIP photos, please let me know in advance and I would be happy to accommodate you. Please do not repost or share these emailed WIP photos unless they have my watermarks on them! 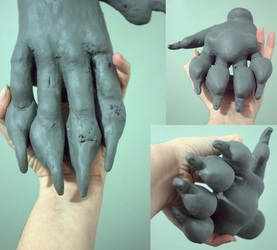 I generally do not share photos of my sculpts, and smaller items like tails and paws may not receive any WIP photos. If requested, three minor changes may be made to any project to attempt to more closely match references/concepts. The difference between major and minor changes is at my discretion, and any changes requested on previously approved stages may incur additional fees. Shipping will be included in the initial quote, as stated above. I ship USPS, and tracking/insurance is included. International customers will be responsible for any VAT/customs fees their country levies. 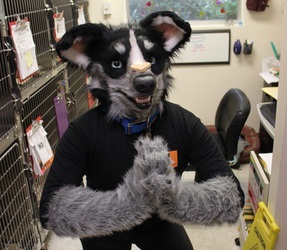 Under no circumstances will I mark your parcels as a gift, and asking me to falsify customs documents will NOT be tolerated, and will be considered abusive behavior. If I am attending a convention you will also be attending, arrangements may be made for delivery of your costume. This is not always possible, and no discount or refund will be given for not physically mailing your costume. My studio is not open to the public, and no studio pick-ups of costumes will be allowed. I strive to not only make my costumes visibly outstanding, but comfortable to wear and durable. Please inspect your costume in full upon receipt. In the event of any shipping damage, retain ALL shipping materials and contact me immediately so we can make a claim with USPS. If there is no shipping damage, please inspect your costume thoroughly and report any defects or fit issues to me within 72hrs of receipt of the costume. If no contact is made within 72hrs, I will take it as an acknowledgement that you accept your costume as delivered. Fit issues will be dealt with on a case by case basis. Minor repairs due to minor errors on either party's part I will repair free of charge, and I will cover half the cost of shipping. Major errors on my part I will repair free of charge, and refund you the cost of shipping it back to me. Major errors on your part (due to improperly given measurements or improperly made DTDs) I will repair, but depending on severity there may be a fee, and I will expect you to pay for shipping both ways. Most errors tend to be minor, and are common with a highly fitted custom piece like these. All other workmanship is covered by a 90 day guarantee. If you require very minor repairs, such as popped seams or loss of a claw, I may opt to refund you a percentage of your total so you can get repairs done locally. Otherwise, I will make repairs at no charge, with the buyer paying half of the shipping total. 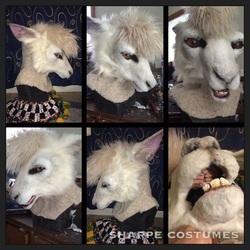 Costumes dirty or damaged due to abuse or neglect, or having alterations/modifications not done or approved by me will be shipped back at the customer's expense, and your warranty will be considered void. I will repair, upgrade, and touch up any of my work, even if acquired second hand, for the life of the costume, for a fee. Costume owners will be expected to pay shipping both ways after the 90 day period expires. Costumes built before 2014 are eligible for a FREE retrofit for fit and jaw movement; please contact me if you have one of these. I work in a home studio, and thusly my workspace is exposed to common household allergens such as the hair/dander of canines and felines, incense, latex, and cleaning supplies. If you have severe allergies to any of these, you may be better served by another artist. I will not be held liable for any personal injury or property damage sustained while wearing my costumes. My work often has an effect on your visibility, dexterity, and/or stability. It is your responsibility to ensure your safety when wearing my work, including having a spotter when out in public, being mindful of heat stroke, and using common sense. Do not participate in contact LARP, roughhouse, go swimming, pilot any vehicle, or over exert yourself. By agreeing to commission me, you agree to the term that using my creations for hateful, discriminatory, or pornographic materials of any kind will cause damage to my reputation. As such, you shall refrain from such activities using my art, or agree to be in breach of contract and be liable for damages in a court of law. These Terms of Service may be changed at any time, but will not be applied retroactively. A PDF copy of my current terms will be sent along with my quote response, and this is the TOS your commission will be bound to. so glad to see you here! thanks for following me back! Hey there. ^^ Your work looks very good. Did you have a price list? I am currently very closed unfortunately! Because my work is as custom as it is, I'm moving away from the 'base price list' way of doing things and doing quotes on a per-project basis. I'll post here when I'm open for quotes! Oh yay you're on here! Now it's a party!